Australian Traveller magazine seeks the charm and glamour on an old-world vessel: ships inspired by the golden age of cruising. So Helen O’Neill boards Holland America’s MS Oosterdam to see if this cruise ship combines classic good looks with savvy service. You may not know much about the mysterious art of towel-animal origami when you board a Holland America Line (HAL) vessel but by the end of your trip you will have amassed a positive menagerie. Each evening as you return to your stateroom (as the cabins are called) you will find, on your perfectly-made bed, anything from a scorpion to a puppy painstakingly constructed from fluffy white hand towels. Our first towelled critter is a crab, adorned with little paper eyes that seem to follow us around our room. A little retro, admittedly, but sweet. On the ms Oosterdam, the Lido Bar is a great place for refreshing breaks from swimming, lounging in the hot tub or catching some sun. We are travelling on the ms Oosterdam, one of the larger vessels of the 15-strong fleet HAL has circumnavigating the planet (with a passenger capacity of 1916). While the ship caters to children and carries a United Nations roll call of guests, the most common accent is American and the typical passenger a retiree. A significant number are repeat customers – one man can be heard explaining proudly that this is his 20th cruise – and it’s not difficult to see why. 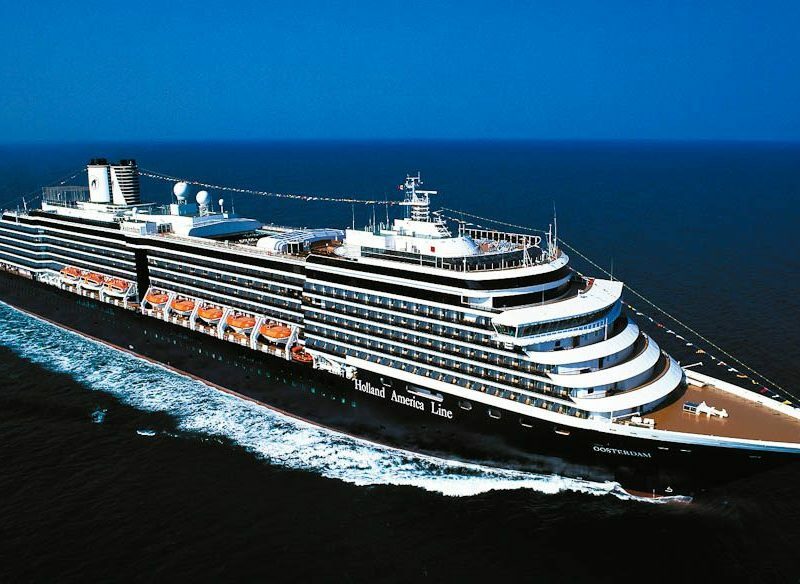 Once you get past the first – of what turn out to be ubiquitous – hand sanitisers (understandable given the recent cruising gastro outbreaks), the ms Oosterdam is like any other good quality, mid-range cruise liner – comfortable, spotless and user-friendly. But like the rest of the HAL fleet, ms Oosterdam is also a total environment: 100 per cent unashamedly Art Deco, albeit a Disney-fied version. This is the type of sparkling, gilt-edged décor that made cruise ship interiors famous; the kind some love, and some love to hate. Occasionally, the interiors here drift a little down-market – in the glitzy three-tier auditorium, for example, and the on board casino. But in other areas, like the Promenade Deck and the Piano Bar, the slick, retro styling only adds to what is genuinely charming space. The eateries are equally varied in both décor and tone, from the often crowded self-service utilitarian Lido Restaurant to the sparkling, silver-service sophistication of the Pinnacle Grill (reservation only). Guests have free run of 11 decks, which are all connected by elevators. And in case you are in complete holiday mode, the elevator mats are changed every 24 hours to remind you which day of the week it is. Outdoor activities, weather permitting, include perambulations on deck three’s wraparound teak promenade (plus optional rest-stops, for those who just can’t resist the lure of a deckchair), the Lido Pool on deck nine (featuring a retractable roof, should the heavens open), the Observation Deck at the stern of deck 10, and the volleyball and basketball courts on deck 11 for the few kids who find themselves on board. First stop is our stateroom, a ‘Veranda’ [sic] suite featuring a queen-size bed (convertible to two singles), lounge area and most dramatically, a private, ocean-hugging balcony. The downside is the bathroom, with a bath too small for any real relaxation and barely enough room to swing a towel-origami cat. It is tidy and will remain so – daily cleaning and extra touches (fresh fruit, chocolates at turndown, the towel-animal origami zoo) are coordinated by polite, friendly housekeepers exhibiting such fastidiousness and attention to detail (they memorise our names instantly) that you can forgive the ms Oosterdam for seeming, at times, a little tired. HAL’s ‘newspaper’ Explorer is delivered to each room daily outlining the activities on board. On our second morning at sea, its front page reveals that the forecast is a partly cloudy 68ºF/20ºC and that tonight’s dress code is ‘formal’ – an unenforced formality that will prove to be read by guests on this ultimately laid-back ship as either ‘smart-casual’ or ‘cocktail’… or completely ignored. Explorer lists a dizzying array of activities in which virtually every whim seems catered for – although given the energy levels of some on board, you wonder how much of a wish-list this is. Events kick off at 8:00am with mass, tai chi and yoga, and run through until 11:30pm when ‘DJ Styles’ takes requests at the Northern Lights Disco on deck two. In between there are quizzes, bridge games, art classes, movies, fitness and aqua aerobics sessions, technical workshops (today’s are on camera use, photo editing and email tips) plus a busy 11:00am champagne reception (held in the Pinnacle Bar on deck two), a ‘Singles and Solos’ lunch from 12:30pm, and a convivial 3:00pm Royal Dutch High Tea. Much is complimentary, including the shows ranging from cheesy individual crooners to surprisingly accomplished cover bands and sparkling song and dance routines. But there is room for retreat by booking a spa treatment or simply settling into one of the comfortable chairs in the Crow’s Nest on deck 10 where, through panoramic windows, you can watch the ocean slide by. 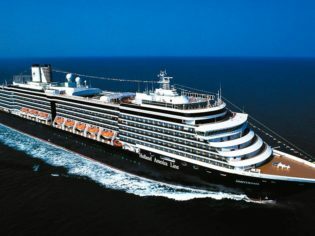 Holland America may not be the most luxurious cruise on the market but there’s an honesty about its approach, and a thoroughness about its service levels, that pays dividends. Disembarking is tinged with disappointment, not least because our cabinet attendant is yet to create a life-sized towel-origami giraffe or T-Rex, but somehow we find ourselves wishing we’d had time to experience that little bit more.